International Women’s Day Event at the Sea of Glass by Celinas Ruth, Esq. International Womenʼs Day (IWD) has been observed since in the early 1900ʼs, a time of great expansion and turbulence in the industrialized world that saw booming population growth and the rise of radical ideologies. In 1908, great unrest and critical debate was occurring amongst women. Women's oppression and inequality was spurring women to become more vocal and active in campaigning for change. Then in 1908, 15,000 women marched through New York City demanding shorter hours, better pay and voting rights. On the last Sunday of February of 1917, Russian women began a strike for "bread and peace" in response to the death over 2 million Russian soldiers in war. Opposed by political leaders the women continued to strike until four days later the Czar was forced to abdicate and the provisional Government granted women the right to vote. The date the women's strike commenced was Sunday 23 February on the Julian calendar then in use in Russia. This day on the Gregorian calendar in use elsewhere was 8 March. Since its birth in the socialist movement, International Women's Day has grown to become a global day of recognition and celebration across developed and developing countries alike. For decades, IWD has grown from strength to strength annually. For many years the United Nations has held an annual IWD conference to coordinate international efforts for women's rights and participation in social, political and economic processes. There were 1,575 International Women’s Day events worldwide on Sunday March 8, 2015. Two of these events were in Arizona – one in Phoenix and one in Tucson. The theme of International Women’s Day this year was MAKING IT HAPPEN IN COMMUNITY. The event was filled with the spirit of friendship and connecting. It was primarily a circle of sisters who care about the world. The quality of the presentations was very high caliber - each one spoke with passion. Celinas Ruth, Esquire, began the celebration sharing about her past and her work in intentional community. She spoke of what she has learned in community, how she had grown, and how we can unite in love and forgiveness. She then spoke about her work with Immigration, Border, & Domestic Issues as Executive Director of Global Family Legal Services. This event was conducted according to the format of a “teaching wheel”. The teaching wheel always includes an activity for reflection and personalizing the subject - and so the audience was asked to share with a neighbor about a woman who had inspired them. Andrea Hammonds, from the International Rescue Committee spoke about the work she does in counseling victims of torture. They have received from the community massage and yoga to help alleviate the extreme suffering the victims have suffered. Tucson has a large refugee community and many people getting involved with them to the benefit of everyone concerned. DeleVan and SanSkritA DellErba (26 year old twins) presented beautifully their own process of connecting with human suffering and being supported in their music (in the band VansGuard) and living at Avalon Organic Gardens & EcoVillage. DeleVan is known internationally for writing the song “Syria.” Their sharing brought tears and their music showed an extreme compassion. They were fabulous. Erin Blanding, Director of Operations for California & Arizona of Me to We & Free the Children showed a power point presentation and shared stories of human struggle, forgiveness, and overcoming. Her organization of Free the Children and Me to We has brought education around the world to help children—and was started by children/young people. Erin showed photos and told stories of two women friends she has encountered in this work who have overcome unbelievable challenges and become a gift to all who meet them. Ana Maria Vasquez, Eco Artist, Musician, & Co-Founder of Bridges Across Borders played panpipes and shared an ancient and traditional song about people coming together in unity under the Creator to make the world a better place. She shared about her life history with her artwork projected on the stage behind her. Her artwork displayed the people and places of her life story which dramatically emphasizes that para-military forces are moving into many areas of the world and turning peaceful, self-sufficient villages into areas of violence and corporate industry. The microphone became available for anyone to share. Many people seemed to be inspired to consider what they can do in the Tucson community at large to make it happen for others in the next year. There were poems shared, discussions of homelessness in Tucson, as well as a plea to make Tucson the first Fuel-Free Fifth Day City by joining Global Community Communications Alliance in minimizing travel in cars on the 5th day of each month. One young man shared about his work with gang members in Tucson and also that he cooks with Maria Garcia (of La Indita restaurant) where he has learned the importance of pouring good energy out into the food when one is cooking. He said that food is just as affected by energy as is water (as has been proved by Emoto in Japan). Eating together afterwards in the Cosmo Art Studio was perfect and very well attended. So much was stirred up and it was special to relax and share food and conversation after so many powerful emotions. And the many donated flowers made it even more special. Women attended from Iraq and Israel and afterwards they struck up a dialog about their 2 countries and the role of America in them looking at the pros and cons of the situations. 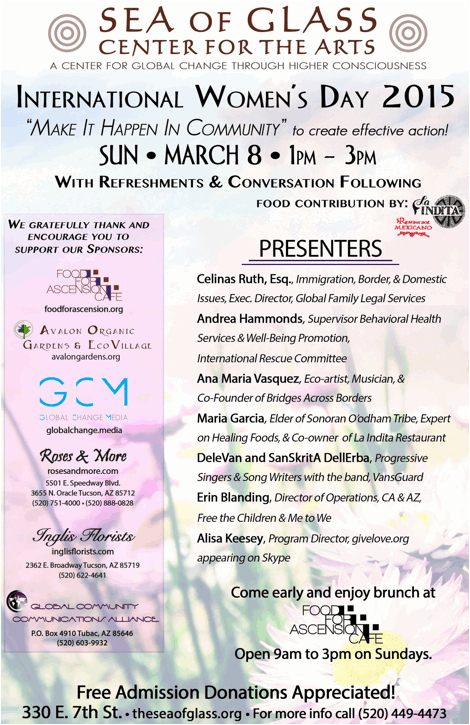 This was the first annual International Women’s Day event at the Sea of Glass in Tucson. Celinas Ruth plans to coordinate this event every year as this has been her dream and it has now become a reality. Thank you to Gabriel of Urantia & Niánn Emerson Chase for supporting this event!